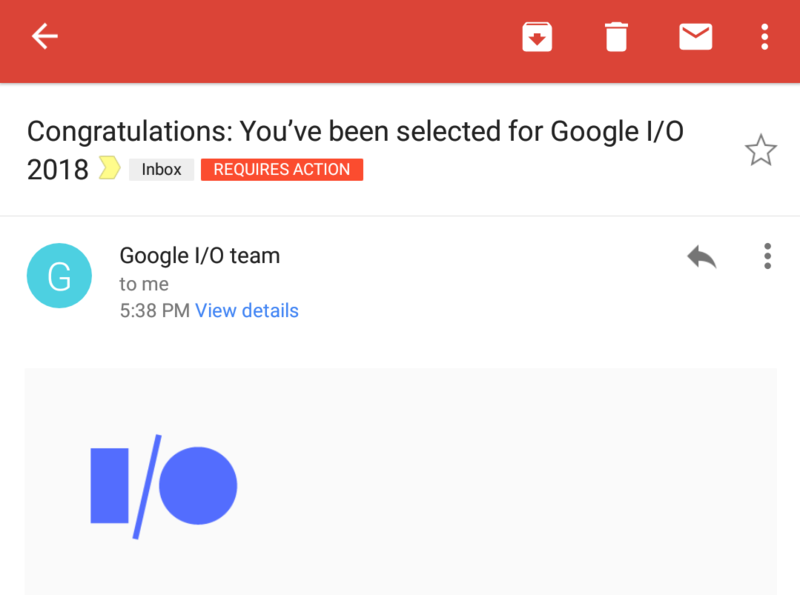 I/O news is abound these days: yesterday we saw that the registration for the ticket raffle was closed and then the preliminary schedule was published revealing focus on Assistant, Chrome and the Web, a new Android Wear session, but still no signs of TV and Auto (though they might be added later). Now we have the first sign of ticket invites being issued to those who tossed their name in the hat. Are you developing things with Google technologies? Can you be at the Shoreline Amphitheater in Mountain View, California on May 18, 19, and 20th? 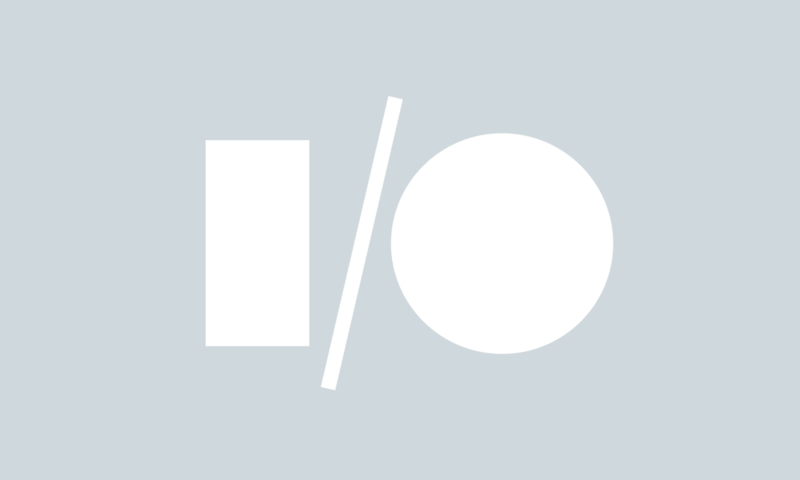 Are you willing to part with $900 for a ticket to Google I/O ($300 for students)? If you answered yes to all of these questions, you might want to get over to the Google I/O site and apply for a ticket. Registration opened up at 9 AM PST this morning and it will remain open until 5 PM PST on March 10th, so you've got a couple of days to get your name into the pot if this isn't a good time. Nintendo's first mobile game won't really be a game - Miitomo is an extension of the Mii system that the company has been building ever since the launch of the original Wii. 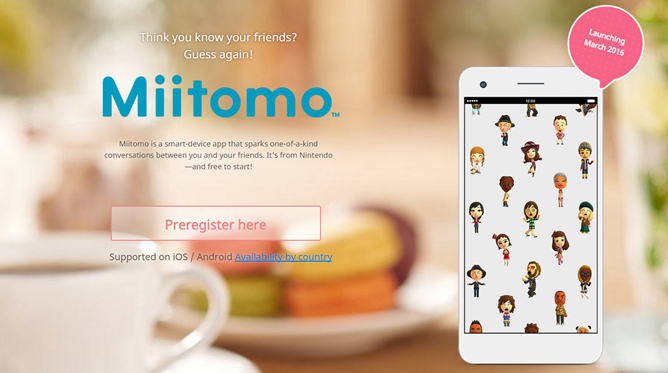 In anticipation of launching the app next month, Nintendo has already opened up a Miitomo website that allows users to pre-register for the app. In addition to drumming up a little press (guilty), this gives users the opportunity to reserve their preferred username. It's all part of the new "Nintendo Account" system, which unifies the somewhat haphazard collection of logins that Nintendo had before. You can create a new Nintendo account (even if you don't own any new Nintendo hardware) on its own or link it with Facebook, Google+, or Twitter. 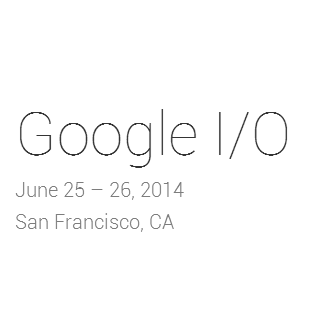 Right on time, Google has opened up registration for Google I/O 2015. For the chance at a ticket, head over to the registration page below and complete the process. 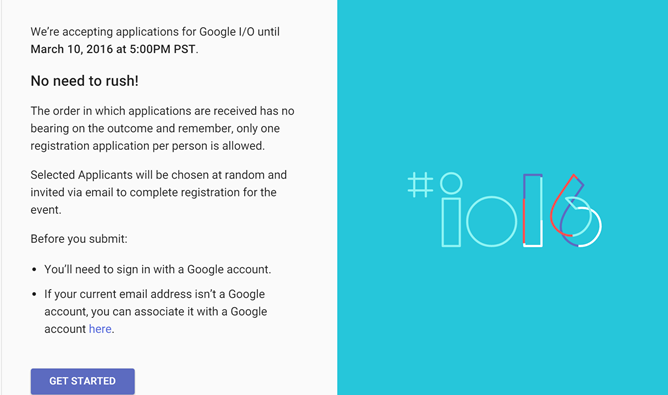 To prevent registration stress, Google is leaving the form open until March 19th at 5:00pm PDT. Presumably, Google will also have a few registration codes hidden across its various web properties just like last year. 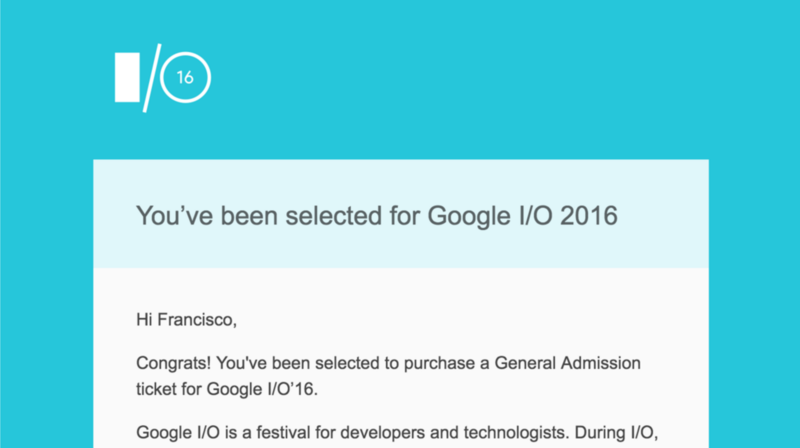 Of course if you can't make it to I/O 15 in person, just drop by AP for all the coverage you need or join an I/O extended event. 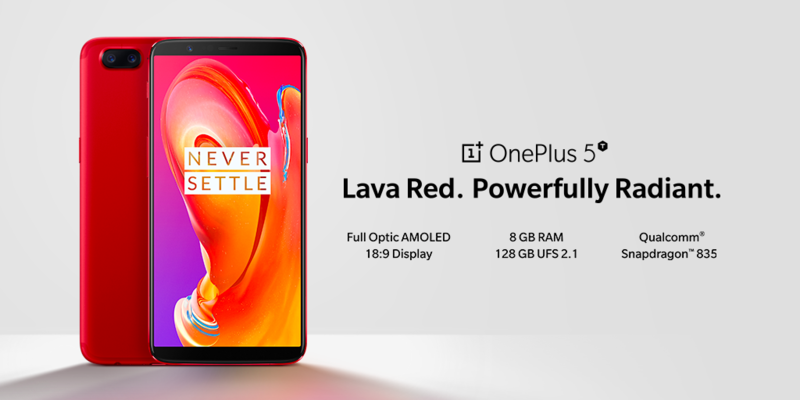 Alright, Android developers and general enthusiasts: the floodgates are open. 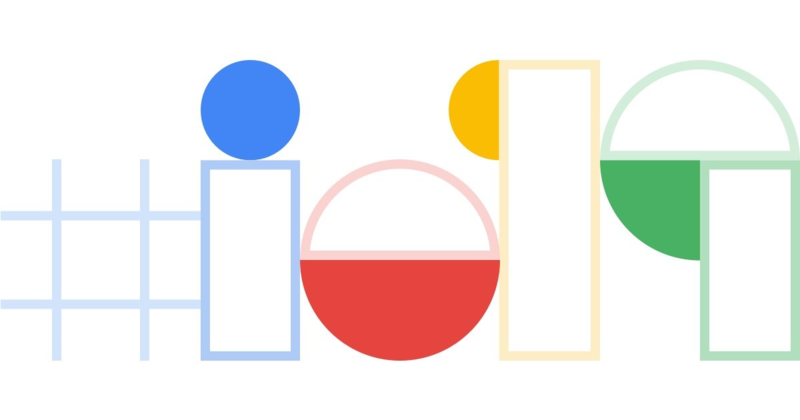 Google is now accepting registrations for Google I/O 2014, which takes place at the Moscone West Convention Center in San Francisco on June 25th and 26th. If you've got a spare nine hundred bucks and the means to get there, you can submit your details and hope for a spot. Things are a bit different this year. Instead of a mad dash for a limited number of tickets, not to mention no small amount of confusion and frustration as Google's registration buckles under the pressure, attendance will be under a general lotto system. One of the biggest complaints about Samsung's latter tablet lines (aside from the plastic builds, outdated specifications, lack of storage, and oh yeah the freakin' smartphone buttons) is that they're too expensive when compared to similar Android tablets. Sammy is hoping to alleviate at least a few of these complaints with some pack-in deals for the Galaxy Note 8.0, Galaxy Tab 3 (all versions), and the Galaxy Tab 2 10.1 Student Edition. 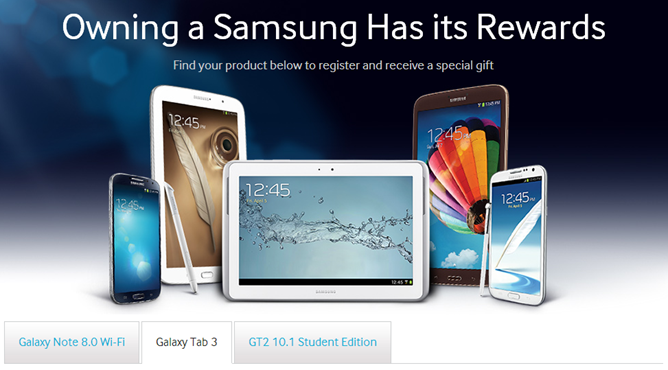 These rewards can be redeemed by registering your new tablet on Samsung's promotional perks page. The Galaxy Note 8.0 fares the best, which makes sense, since it's the most premium of the tablets.